1. Preheat the oven to 200ºC, gas mark 6. 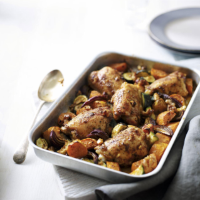 Place the chicken, vegetables and walnuts in a large roasting tin. then drizzle over the chicken and vegetables. plates and serve with your favourite green veg.